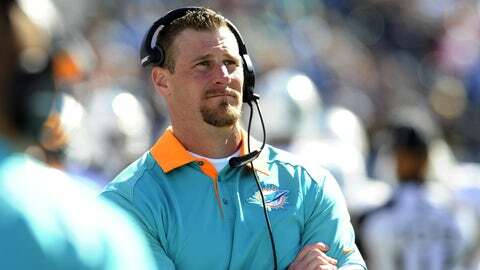 Can Dan Campbell save the Dolphins? Miami Dolphins interim head coach Dan Campbell inspired a win for on Sunday, and hopefully is a sign of the changing tide in south Florida. To say that the Miami Dolphins looked like a different team on Sunday would be a huge understatement. Aside from a pair of Ryan Tannehill interceptions, very little went wrong for Miami in a 38-10 road victory over the Tennessee Titans in the first game under interim head coach Dan Campbell. Entering the contest, the Dolphins were one of only two teams in the NFL without a rushing touchdown. Miami was dead last in the NFL with only one sack through four games and had trailed by double-digits in the first half in every game. Miami also entered Sunday’s contest in Nashville with only three takeaways on the season. Whether it was a new energy brought by Campbell, the reported more intense practices or a different overall strategy, the changes paid instant dividends as the Dolphins improved to 2-3. It took the Dolphins just four minutes and 21 seconds to get off the rushing touchdown snide as receiver Jarvis Landry took a reverse 22 yards for a touchdown. Lamar Miller broke the century mark and scored a touchdown, finishing with 113 yards on 19 carries while the Dolphins as a team rushed for a season-high 180 yards — 72 more than their previous best this season. Under new defensive coordinator Lou Anarumo, Miami forced rookie quarterback Marcus Mariota into four turnovers, including an interception returned 30 yards for a touchdown by safety Reshad Jones. The Dolphins kept Mariota under constant duress, finishing with six sacks as a team with four coming from All-Pro Cameron Wake. Wake was held without one through the first five games. After a slow start, offseason acquisition Ndamukong Suh batted down a pair of passes at the line of scrimmage Sunday afternoon. Earlier in the week, Wake said the team had bought into Campbell’s methods since he once played the game himself. Whether Sunday’s dominating victory was just an inspired effort or a sign of things to come will be known later in the year, but for a team that had been written off after beginning the year with high expectations, it certainly brings reason for optimism. It shouldn’t be long before we know whether or not Campbell can resurrect a season that appeared destined for the dumps. Miami will have a chance to get back to .500 at home against the Houston Texans on Sunday before three straight road games against the New England Patriots, Buffalo Bills and Philadelphia Eagles. For at least one week, there is life again for South Florida’s NFL franchise. Capturing the AFC East for the first time since 2008 looks to already be out of reach, but the playoffs might not be as only five of the 16 teams in the AFC currently have fewer than three losses. There is still time for the Dolphins, but that time needed to start yesterday. Fortunately for Miami, there’s reason to believe it did.